Almost four years ago I dabbled in a brief project with the goal of using a set of wireless speakers so I could hear notifications from my computer. That project failed, mostly due to the hardware I chose. Admittedly, I never put much effort into it. Recently, I decided to revive this concept to enhance my interaction the new ASUS EeeBox PC, especially since I’m planning to use Speech Recognition and Text-to-Speech for various tasks and notifications. Having just one set of speakers at the computer wouldn’t do. I wanted to have at least a couple of speakers around the house. On the old home automation system I had a setup that, when a motion sensor was first triggered after a certain time on a weekday, would cause the computer to play a one minute clip from a different 80s song. It was just a bit of fun to help the two of us relax after long days at work. The combination of software did work. However, the audio could only be played from the one room, on the far side of the house. With my new speaker setup this would have more of an impact. That is, of course, just the beginning of what I’d like to do. I could have gone all out and installed wired speakers in the ceiling of every room. However, that project wouldn’t get done for a long time. I know how I’d handle it – I wouldn’t accept cheap components, so I’d have to save up to buy what I’d really want. This week I opted for a less expensive, easy to install version. Instead, I purchased a wireless speaker set that includes two speakers and one transmitter. 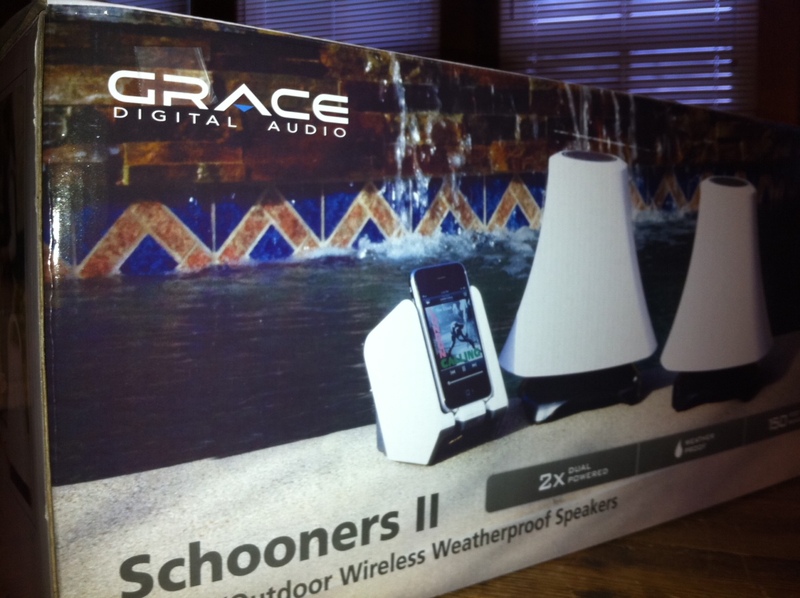 I ordered the Grace Digital Audio Schooners II set via Amazon after reviewing several different sets of similar packages. I settled on this brand because of a mix of cost, reviews, and features. In the end, I think I received what was expected. The sound quality is good. It’s not exceptional – if you’re an audiophile then you may not like these but for our needs they’re just right. There isn’t much to the transmitter. It has a single 3.5mm audio connector, power connector, on/of slider switch, and another slider to switch between channel 1 or 2. The speakers have an “auto tune” button to sync with the transmitter, a power button, and + and – buttons for volume control. They don’t have treble or bass controls, but I didn’t have a problem with that. The speakers can operate from the included power adapters or from 6 AA batteries. I took one outside for a few minutes and it still worked despite being outside on the opposite side of the house from where the transmitter was positioned. It did suffer from some static while I was carrying the speaker, but once I set it down it cleared up. The quality at that range seemed a bit weaker but it wasn’t bad considering how far it was and that it was running on batteries. Inside the house I didn’t notice any problems. The audio connector from the transmitter is very thin, retractable, and connected to a hidden spool that can be used to pull the slack back. This concerns me because if the cable is damaged than the whole system will be rendered unusable. I connected a 3.5mm extension cable to reach the computer, but this may also help preserve the life of the cable. I was slightly concerned that their operation in the 2.4 GHz range might interfere with my WiFi, but so far I haven’t noticed a problem. My wireless is provided by an Apple Airport Extreme Base Station (Dual Band). Another feature I like is that they don’t power down after the audio signal is terminated. At least, they’ve remained operational several hours after I first connected them to the computer. The only very annoying characteristic is the audio signal LED on the transmitter. It’s a steady, bright blue when the transmitter is receiving audio from a source, but irritatingly blinks when nothing is received. To handle this I did the same thing I usually do with bright, annoying LEDs. I covered it up with black electrical tape. Though I’ve only had these for a matter of hours I’m pleased with this purchase. Hopefully, they’ll hold up for a long time. Overall, I think I received exactly the quality that I paid for. If anyone reading this decides to purchase a set then I recommend searching for multiple sellers, if you go through Amazon. I noticed several storefronts had the same package being sold for a good bit more than I paid. Also, regardless of whatever wireless speaker set you may choose it’s best to always remember to keep in mind the frequency that they operate on and the devices that you already have in your home. For example, if you have a 900 MHz cordless phone set that you don’t want to get rid of then you may not want to purchase a speaker set that operates at 900 MHz. It’s not a guarantee that a particular wireless set will interfere. In fact, while my speakers are in the 2.4 GHz range they may not actually overlap the standard WiFi frequencies. I suspect that many of the bad reviews for different brands of wireless speakers can be attributed to interference with cordless phones, wireless routers, and other devices. Updated 08/19/2011: I noticed a delay of a few seconds before the speakers kicked in, after they’d been unused for many hours. When using a computer to sound alerts it might make sense to play a short tone before the message itself to wake the speakers, if they’ve gone into stand-by. Updated 08/24/2011: We’ve been using these speakers for about a week now and I think we’re both satisfied with them. These aren’t “audiophile” quality speakers but if you want good sound at a fair price then they may fit the bill. We’re not really using this system for video streaming, but it has seen a bit of use for playing music from the iTunes library or via Pandora. For iTunes I use the iOS Remote app to control the music. The Rii mini keyboard makes it relatively easy to control other audio applications, though once in a while I also use Remote Desktop (with it set to play audio only on the remote Windows system). Updated 12/31/2014: I stopped using these a couple of years ago. Unfortunately the transmitter appeared to develop problems with interference or an internal wiring problem and after some attempts at troubleshooting I finally gave up and got rid of these speakers.